Are you thinking of studying an MBA? Want to launch a career in Asia? These top four business schools say that Asia can give you a competitive advantage. Why does Asia matter? According to Nick Soriano, Admissions Director of Nanyang Business School, the answer is a no-brainer. For one cold Tuesday evening in December, Asia came to London. 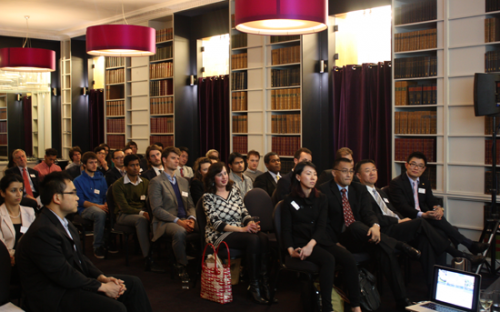 Four of the region’s top business schools – China Europe International Business School, Nanyang Business School, the Indian School of Business and Hong Kong University of Science and Technology – attended an event in the UK to promote the benefits of studying and launching a career in Asia. Many of the world’s top business schools are in the region and international students are flocking to Asian MBA programs in higher numbers than ever before. Global MBA Rankings show that five b-schools in China, including CEIBS, are ranked in the top-100 worldwide, while Nanyang is ranked in the top-50. Deciding where to study is an important decision, but deciding where to begin a career is even more so. More often than not, they are the same – and according to these top business schools, opportunities in Asia can give your career a competitive advantage. Nick says an MBA from Asia will distinguish you from other graduates. “You will have a better understanding of the culture of business in Asia,” he said form the Royal Institution in Mayfair. “If you want a career in Asia, you will have an advantage. Shimin Chen, MBA Program Director at CEIBS, says that an MBA in Shanghai will set you apart in all regions of the world. “About forty per cent of our cohort is from outside China, representing around thirty countries,” he said. CEIBS is one of the top-twenty MBA programs globally, and Shimin says students can use CEIBS to both kick-start careers and switch industries. The curriculum is comparable to any business school in the world, he says, and networking opportunities are second to none. “We have many networking opportunities, and our students are highly sought after in China,” he said. “We have alumni working for multi-national companies, helping to manage relationships with China. HKUST may be based in Hong Kong, but it is their multi-national faculty that sets them apart from other business schools. According to Pauline Cheung, Manager of Marketing & Admissions, MBA Programs, international students thrive at the b-school. HKUST has a strong focus on China and international students will have a good opportunity to launch a career in the country after graduation. Ranked #8 by the FT’s 2013 full-time MBA Rankings, HKST has around 100 students with over 30 different nationalities. Hong Kong may be a centre of excellent for finance, but HKUST is big on entrepreneurship. “It’s a good place for people that want to start-up businesses,” Pauline added. “There is a low tax-rate and the city is flexible. The economies of China may be booming, but India is one of the strongest emerging markets. Studying at the Indian School of Business will give you many career opportunities, according to an MBA alumnus representing ISB at the event. “The growth of India and China has been backed by many different sectors,” he said. The one-year program at ISB, ranked #34 in the FT’s global MBA Rankings, offers the same depth of study as a two-year program, but it is condensed. You won’t be out of the job market for long and ISB MBAs have some of the best career opportunities in Asia. “Around four-hundred companies recruit from our campuses,” he said. “The top-five companies from all sectors come to our campus to recruit. It gives you a huge opportunity for work placements. MBA Jobs: Can Asia Give Your Career A Competitive Advantage? One year MBA programs in Asia have had a strange history. At the turn of the century, such programs were virtually non-existent. Then the Indian School of Business (ISB) opened its doors in 2001, pioneering the concept of the one year program for experienced professionals in India. Till then, the flagship programs of the Indian Institutes of Management (IIMs), each of a two year duration, ruled the roost completely. Initially, the one year concept was met with skepticism, but ISB’s wild success in a short period forced even the IIMs to go for a rethink.